Earlier this week I flew from Los Angeles to Hong Kong aboard a brand new A350 on Hong Kong Airlines. Overall, I was quite impressed by the flight. First, I did not wind up with the new reverse herringbone business class product (I missed it by a day as only one aircraft, B-LGE, has the new seats). Nevertheless, the seat was comfortable for the 15hr journey to Hong Kong. While Hong Kong Airlines offers a nice blanket and pillow, the bedding is much more limited than some of the competition. To contrast, United offers a mattress pad, light blanket, and cooling gel pillow in addition to a similar sleeping blanket and pillow on their flights to Hong Kong. But that did not stop me from sleeping nearly 10 hours without interruption. That is particularly remarkable considering the 10:45 A.M. departure from Los Angeles, but I stayed up the night before–my trick to avoid jetlag. Every member of the crew was young and seemed to be a bit more laidback than on Cathay Pacific. Food was good overall. The appetizer and soup were forgettable, but the main course of rack of lamb was very good. The garlic bread was also very strong, but delicious. And perhaps the best part of the meal was the cheese course. Although the cheeses were not listed on the menu and I am admittedly not a cheese connoisseur, I loved all of them. The meal concluded with a nice piece of rhubarb cake and espresso. Prior to landing a second meal was served. I chose risotto with chicken. The chicken chunks were fatty, but the risotto and vegetables were tasty. More garlic bread as well! Overall, I greatly enjoyed my first flight on Hong Kong Airlines and look forward to three more flights in the days ahead. Stay tuned for a full review next week. 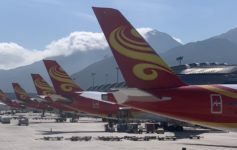 Hong Kong Airlines leased four A350s from another company, and weren’t allowed to change the seats. Then recently they took delivery of their first “very own” A350, which features entirely new seats. As Matthew flew the leased configuration, he got the “old” seats. Hi Alvin! I fly out on this same route December 3rd! Is it possible to find out if I have the B-LGE tail? Josh, use Flight Radar 24 to track B-LGE. Also, check out my post coming in about 15 minutes with pictures onboard this new aircraft.